The number of new measles cases in the United States rose again this month, the Centres for Disease Control and Prevention said Monday, bringing the total number to 555 in 2019. This year’s outbreak is on course to be the worst since the country eliminated measles as an endemic disease in 2000. Health authorities reported 90 additional cases as of Thursday, with outbreaks in New York, Washington, California, New Jersey and Michigan, up from 78 the week before. Those cases were largely linked to travellers returning from countries seeing outbreaks of their own, including Israel, Ukraine and the Philippines. The disease then spread through populations in which large numbers of people are unvaccinated, the CDC said. More than half the cases this year were reported in New York City, where the latest number was 285. 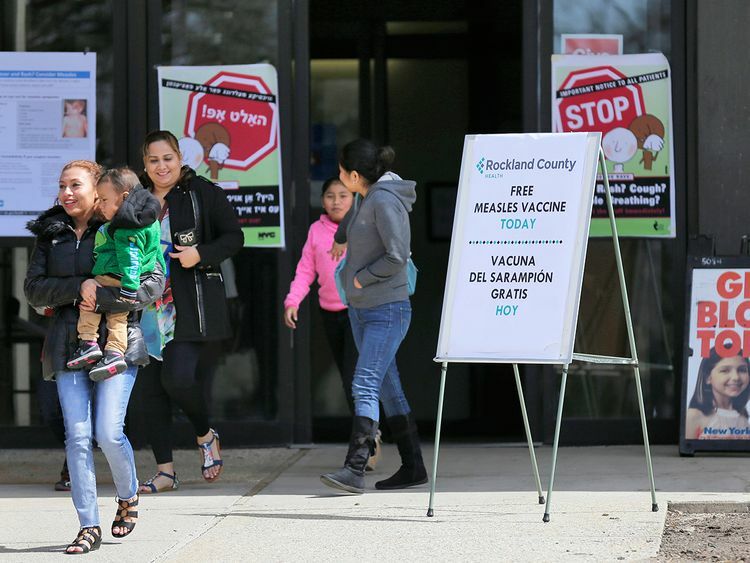 In Rockland County, to the north of the city, health authorities updated their count Monday to 186 cases. The US outbreaks come as the incidence of measles is rising all over the world, according to preliminary numbers from the World Health Organisation. Reported cases tripled globally in the first three months of 2019 compared with the year before, the WHO, a UN agency, said Monday. The WHO said every region of the world was experiencing outbreaks, both in poor countries with low vaccination rates such as the Democratic Republic of Congo and wealthier countries like the United States and Israel, where the agency said the disease had spread among unvaccinated communities. “This is a very unforgiving disease,” said Dr Saad Omer, a researcher at the Emory Vaccine Centre in Atlanta who studies immunisation coverage and disease incidence. The illness killed close to 110,000 people worldwide in 2017, according to the WHO. The global spike in measles reverses a celebrated public health achievement. A worldwide effort succeeded in bringing down measles cases by nearly 80 per cent from 2000 to 2016. Experts attribute the new outbreaks to several causes. Enduring poverty limits access to the vaccine in countries with threadbare public health systems. This is compounded by rumours that the vaccines are harmful, leading parents to refuse to vaccinate their children. “It’s rarely a single cause,” Omer said. Epidemiologists say that a vaccination level of 95 per cent is needed to prevent outbreaks, but global coverage of the first dose remains at 85 per cent, the WHO said. In the US, authorities said in 2000 that domestic measles had been eliminated, and the cases that have occurred since then have been traced to visitors returning from countries where outbreaks have occurred. The size and spread of the outbreaks this year do not come as a total surprise, Omer said, because vaccination refusal rates have been rising in the United States. In a study that Omer and his colleagues published in 2016, researchers warned that the risk of outbreaks would increase as the overall pool of unvaccinated children swelled. “What do you start seeing after that happens? You start seeing more frequent outbreaks, and their size increases,” he said. School mandates are quite effective in the US, he said, and the CDC, working with local health authorities, is able to play a firefighting role.